Inside Tasmania: I Voted For Jacquie Lambie So Why Did I Get A Coalition Representative? I Voted For Jacquie Lambie So Why Did I Get A Coalition Representative? I.T. voted for Jacquie Lambie as a Senator for Tasmania. Now we find we are represented by a Nationals senator WTF? It shows the disregard conservatives have for democracy. Was Steve Martin bribed by the Coalition and if so how much? As long-term political observers, we suspect Martin was a Liberal plant from the beginning and there was probably another one in the state election as well. The conservatives are exceeding dirty players, appealing to some of the basest desires of humanity. Things like killing the planet for greed, torturing sheep, and destroying the Great Barrier Reef. The fact is Steve Martin could have stood for the Senate as a National but he didn't. He stood for the Lambie network and when she had to resign he dumped on the people who voted for Jacquie. This is not how democracy works. There are angry voters out there. 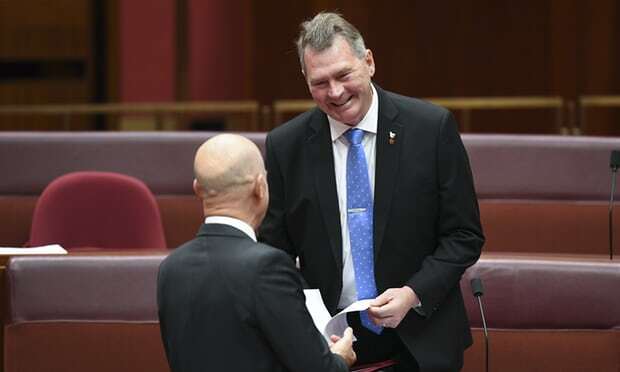 Tasmania already has a distorted senate gaggle with 12 senators representing 500,000 people. Every Tasmanian is represented by 19 parliamentarians. The highest number of politicians per head in Australia. Remember that Steve Martin? You are just one of too many senators riding the gravy train. You were not even get elected by the people. You did it through the back door. So what was it about the Nationals that you couldn't resist? Maybe it was the Barnaby Joyce love triangle that did it? We predict Martin will achieve nothing for the planet, Australia or Tasmania. The guy is just a low-life opportunist in our opinion. I.T has a message for your Steve Martin. Don't stand again because we will work hard to make sure you are not elected. Don't get too comfortable on the graveytrain because 6 years goes past faster than you think.